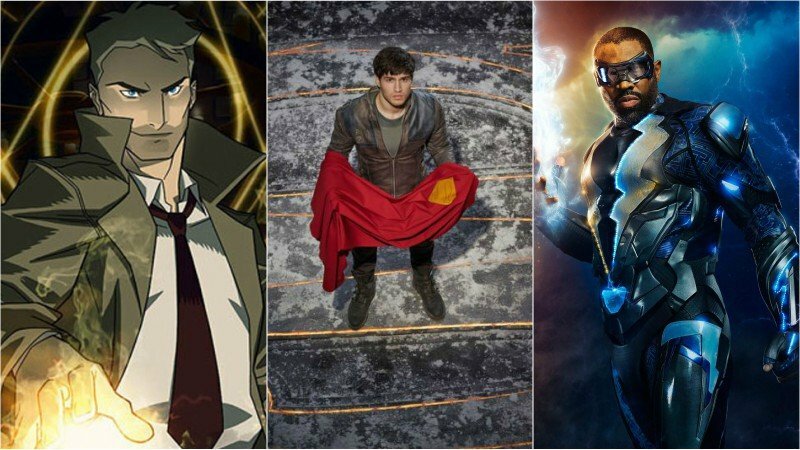 WBTV WonderCon Schedule Includes Krypton, Constantine, and More! 3:30–4:30 p.m. Teen Titans Go! Special Video Presentation and Q&A — The Titans are back at WonderCon and they’re bringing all the fun, laughs and hilarious hijinks that are part of every Teen Titans Go! panel. You only need to bring your questions (and maybe some waffles and pie) for producers Michael Jelenic, Aaron Horvath and voice actor Greg Cipes who will answer your questions about all things Titans. Produced by Warner Bros. Animation, Teen Titans Go! airs Fridays at 6/5c on Cartoon Network. 10:00–11:00 a.m. Constantine World Premiere Screening — A WonderCon Anaheim exclusive! Don’t miss the world premiere screening of the first episodes of the animated Constantine series for CW Seed! This new series from Blue Ribbon Content and Warner Bros. Animation follows DC’s popular comic book character John Constantine (voiced by the live action series star Matt Ryan), a seasoned demon hunter and master of the occult. Constantine is executive produced by David S. Goyer, Greg Berlanti, and Sarah Schechter. Join series star Matt Ryan, plus series writer J.M. DeMatteis (Justice League Dark, Batman vs. Robin) and Blue Ribbon Content & Warner Bros. Animation’s Peter Girardi for a Q&A session after the screening. The first season of Constantine begins streaming March 24 at CWSeed.com. 2:00–3:00 p.m. Krypton Special Video Presentation and Q&A — The never-before-told story of Superman’s ancestors, set two generations before the destruction of his home planet, Krypton follows Superman’s grandfather, Seg-El (Cameron Cuffe) as he’s faced with a life or death conflict – to save his home planet or let it be destroyed in order to restore the fate of his future grandson. Join showrunner and executive producer Cameron Welsh (Ash vs. Evil Dead), DC Entertainment executive Dan Evans, and stars Cameron Cuffe (The Halcyon), Georgina Campbell (Black Mirror) and Shaun Sipos (Melrose Place) as they provide exclusive insight into this highly-anticipated new series from executive producer David S. Goyer, Warner Horizon Scripted Television, DC Entertainment and SYFY. Krypton premieres March 21 and airs Wednesdays at 10/9c on SYFY. 10:30–11:15 a.m. Lucifer Exclusive Screening of Brand New Episode — Consider this your deal with the devil! Lucifer fans will not only have the opportunity to screen an upcoming episode of the devilish drama, but also a special video message from series stars Tom Ellis, Lauren German, Tom Welling and Aimee Garcia. From Jerry Bruckheimer Television in association with Warner Bros. Television, and based upon the characters created by Neil Gaiman, Sam Kieth and Mike Dringenberg for Vertigo from DC Entertainment, Lucifer airs Mondays at 9/8c on FOX. 12:45–1:45 p.m. Black Lightning All-New Episode and Q&A — Where there is darkness, there is…Black Lightning. Jefferson Pierce made his choice: he hung up the suit and his secret identity years ago. But with crime and corruption spreading like wildfire, and those he cares about in the crosshairs of the menacing local gang, The One Hundred, he must return as Black Lightning — to save not only his family, but also the soul of his community. Join series producers and writers to watch the electrifying never-before-seen “Sins of the Father” episode of Black Lightning, followed by a Q&A session. Based on the DC character created by Tony Isabella with Trevor Von Eeden, Black Lightning is produced by Berlanti Productions and Akil Productions, in association with Warner Bros. Television. Black Lightning airs Tuesdays at 9/8c on The CW.